Now, sixty-six years after our founding, and under the baton of Allan Taylor, our mission remains the same — to create beautiful music, and to have fun doing it. Mr. Taylor is an accomplished concert organist and harpsichordist, and an adjunct professor of music at Westfield State University. He combines a dry wit with a passion for music, and is a joy to sing for. For more about Maestro Taylor, visit the Conductor page. Randall Thompson conducts a combined chorus including HCS in the 1959 premiere of Frostiana. 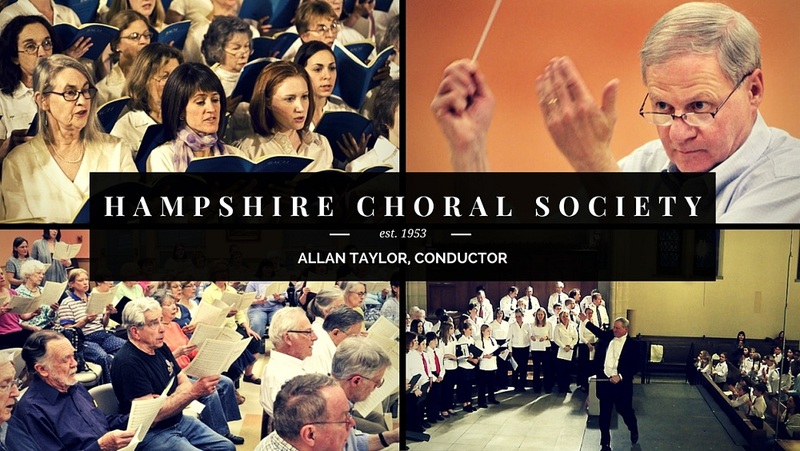 The Hampshire Choral Society was founded in 1952 by members of the Northampton-Amherst Chorus, an ad hoc group of singers assembled to help the Springfield Symphony with a performance of the Berlioz Requiem. In the sixty-four years since, we have become an integral part of our community. We have sung for the occasion of the Northampton Tercentenary celebration in 1954, for Hatfield’s Tercentenary in 1970, and, most recently, for Northampton’s 350th Convocation. In 1959, for the town of Amherst’s Bicentennial, HCS joined with other singers to premiere Randall Thompson’s famous settings of Robert Frost’s poems, Frostiana. Thompson conducted the group, and Frost was in the audience. Over the course of sixty-six years, we have had seven different directors and thousands of members, performed throughout the Pioneer Valley, and toured Romania and England. In 1999, under then-director Elizabeth Hart Damon, we created two new choral groups; the Young People’s Chorus, a choir for elementary to high-school aged children, and Singers’ Project, an elite vocal ensemble. The Young People’s Chorus continues to thrive under the talented direction of K.C. Conlan, and joins with HCS in our fall concert. Singers’ Project is no longer affiliated with HCS, but a similar group is flourishing under Ms. Hart Damon’s direction. Our current director, Allan Taylor, took over from Ms. Hart Damon in 2001. In 2003, our 50th Anniversary season, Mr. Taylor conducted us to rave reviews in a performance of Felix Mendelssohn’s oratorio Elijah. Under his leadership we have continued to thrive and our audiences and reputation continue to grow. The chorus had an exciting 2011-12 season. In January we performed the North American premiere of Ralph Vaughan-Williams’s A Cambridge Mass under the baton of maestro Alan Tongue. He and our conductor, Allan Taylor, collaborated, first by long-distance phone and e-mail conversations, to prepare the chorus and orchestra. The performance before almost a thousand people at Smith College’s J.M. Greene Hall was a rousing success. In May we performed an equally exciting, satisfying, and well-received concert in collaboration with the Pioneer Valley Symphony and Chorus. Allan Taylor conducted the orchestra and joint choruses in the beautiful and moving Haydn work, Missa in Tempore Belli, and PVS’s Paul Phillips conducted the symphony and both choruses in the challenging and rousing Belshazzar’s Feast, by William Walton, to enthusiastic acclaim. Our first solo performance at the Fine Arts Center of UMass in May of 2013 was to celebrate our 60th year. The centerpiece of our program was Beethoven’s Mass in C, opus 86, which is widely regarded as one of his masterpieces. After the concert at a festive reception we had on display many historical programs, pictures and mementos which were appreciated by our singers and our guests. Our 2014-2015 season began with a performance of the dramatic Solemn Vespers of Wolfgang Amadeus Mozart and the appealing Chandos Anthem, Let God Arise by George Frideric Handel. In May of 2015 we had the unique experience of presenting a rare performance of the first masterpiece of choral music by an American composer, John Knowles Paine’s Mass in D. It was the first performance of this important work in New England in many years. In the Spring of 2016 we presented the spectacular Ein Deutsches Requiem by Johannes Brahms. As Allan Taylor, our Music director has said: “His achingly beautiful music is immediately appealing, yet it rewards continued study and repeated hearings.” It seems we have gotten into a bit of a tradition in singing this master work, 1986, 1996, 2006 and then, 2016. This concert was held at the Fine Arts Center to an audience of over 600. A recent concert of Mendelssohn’s Elijah was sung in collaboration with the Pioneer Valley Symphony Orchestra and Chorus. It happens to have been the last collaborated concert under the direction of Paul Phillips since he has resigned as the PVSO director. We wish him well in his new endeavors.